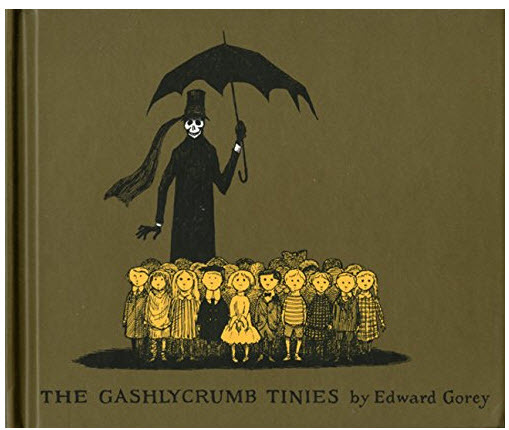 Edward Gorey created a creepy alphabet book called The Gashlycrumb Tinies. The Tinies have a very difficult time surviving. They die in a number of different ways in Gorey's alphabet book. The twenty-six children die in different ways as the dark humored book takes the reader from A to Z. The entries are accompanied by fascinating, dark drawings. Death is standing behind the children holding an umbrella on the book's cover. It is an alphabet book but it really isn't appropriate for small children unless the parent wants to explain death as well as the alphabet. The book begins with "A is for Amy who fell down the stairs." It follows with "B is for Basil assaulted by bears." For this entry an image shows little Basil surrounded by two very large bears. Other entries include "C is for Clare who wasted away" and "W is for Winnie embedded in ice." Poor little Winnie. The back of the book shows a collection of tombstones. The Edward Gorey house notes that Gorey's alphabet book has remained in print every since it was published. The book reached its 50 year milestone in 2013. It available for purchase from Amazon.com.